A new £250m road to relieve congestion in Flintshire has been backed by the Welsh Government. Economy Secretary Ken Skates told AMs on Tuesday that he was giving the green light to the red route - which will see the A548 upgraded and a new link built to connect it to the A55. Preliminary design work has been ordered to examine environmental and engineering issues. "I'm hopefully that this can all be completed quickly," Mr Skates said. "The proposed route will help address the chronic congestion the area suffers," he added. "It will improve journey times for both businesses and commuting traffic - it will also strengthen the social and economic links between north Wales, Deeside Industrial Estate, Chester and beyond." Two proposals to resolve congestion had been put forward to consultation. 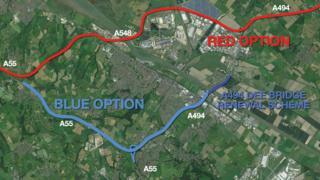 The blue route would have seen the existing A55 and A494 improved. The red route - which was backed by Flintshire council - proposes an upgrade of the A548 over Flintshire Bridge between Connah's Quay and the Wirral, and a new link to the A55 at Northop.